Thank you very much to Helen who went to see “How do reindeer fly” yesterday and sent her review to me last night!!! Proteus Christmas Show lives up to expectations! We went to the Proteus children’s Christmas show last year and the year before and absolutely loved it both times, so we were very excited about going along to ‘How do Reindeer Fly?’ this Christmas. Expectations were very high for what is fast becoming a Christmas tradition in our house. 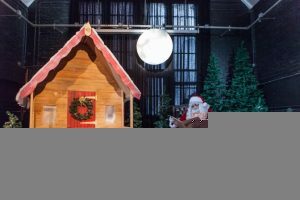 In ‘How do reindeer fly?’ The audience are invited to Christmas HQ to see the elves at work. After a creative demonstration of gift-wrapping the elves take a hard earned tea break and then, once all the ‘visiting elves’ are sporting reindeer antlers, they introduce us to Donner and Blitzen. Things go a little bit awry and Mary Christmas has to call on the visiting elves (children in the audience) to save Christmas. As with previous years’ shows, the audience seamlessly become part of the show with the children helping the elves with the magic that makes the reindeer fly. There is less moving between rooms than in previous years, with the show mostly based in one room. This seems to work well and there is a greater sense of space than in previous years. Towards the end there is a short walk into another (beautiful!) snowy space. Here there are some lovely sensory activities and then Father Christmas arrives to tell the children a story. The show did not disappoint. My 4 year old belly-laughed more times than I could count and was completely engaged with the story and the activities. My 1 year old was so fascinated by what was going on that he actually sat still for a while! He enjoyed meeting Donna and Blitzen so much that he kept going back to look for them when they had gone. The team at Proteus seem to have a knack for producing children’s shows that are entertaining, funny and interactive whilst being lovely and relaxed. ‘Heartwarming’ is the best word I can think of to capture the atmosphere they create. Overall we had a brilliant time, we left with many happy memories and some Christmas souvenirs. The team at Proteus should be commended for creating, once again, an imaginative, wonderful Christmas story. We’ll be back next year for more! How do reindeer fly is showing at Proteus creation space until Saturday 24th December and is sold out (sorry!). Even if you’re too late for this years’ show make sure you check out what they’re doing next year! 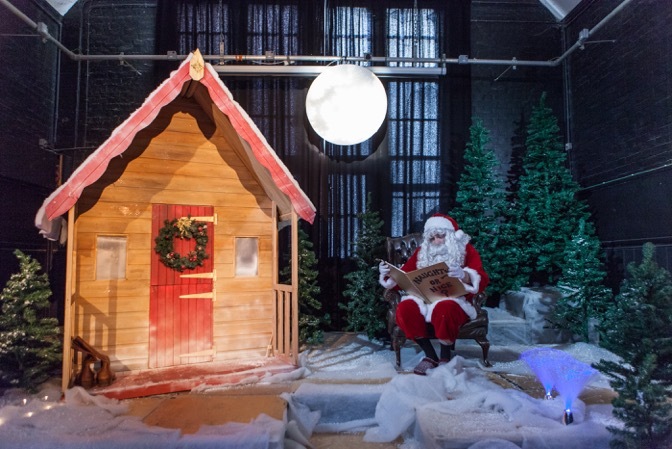 I’m told that children who attended the show will receive an email from Father Christmas sometime this weekend! The children meet Father Christmas at the end but he tells the group a story. There is no expectation of a one-to-one so it would be fine for children who are less keen on meeting him. Most of the children there were around 3-6 years I would guess, with a few younger siblings. The show is advertised as a preschool show and it is perfect for preschool-aged children. Older children probably wouldn’t get a lot from it. Although this is an interactive show there is no pressure and parents can stay with children and help them at all times. Proteus has baby changing, toilets, a café (with amazing cake!) and free parking. ← Merry Christmas and a Happy New Year!! !